Scroll to the end of this blog for a full-size PDF that is downloadable. 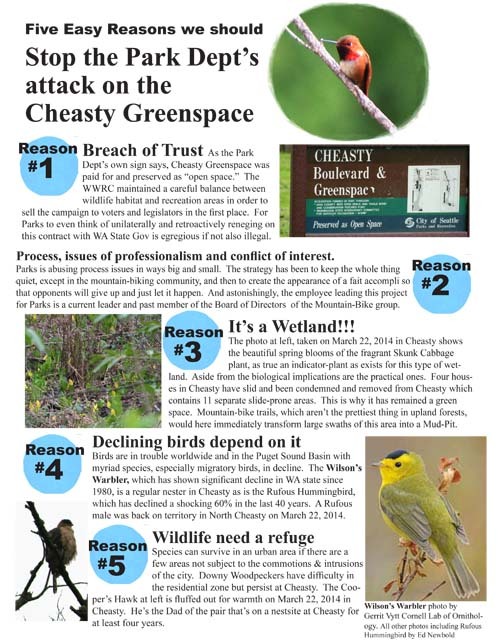 As the Park Dept’s own sign says, Cheasty Greenspace was paid for and preserved as “open space.” The WWRC maintained a careful balance between wildlife habitat and recreation areas in order to sell the campaign to voters and legislators in the first place. For Parks to even think of unilaterally and retroactively reneging on this contract with the WA State Gov is egregious if not also illegal and a breach of trust. Parks is abusing process issues in ways big and small. The strategy has been to keep the whole thing quiet, except in the mountain-biking community, and then to create the appearance of a fait accompli so that opponents will give up and just let it happen. And astonishingly, the employee leading this project for Parks is a current leader and past member of the Board of Directors of the Mountain-Bike group. The photo at left, taken on March 22, 2014 in Cheasty shows the beautiful spring blooms of the fragrant Skunk Cabbage plant, as true an indicator-plant as exists for this type of wetland. Aside from the biological implications are the practical ones. Four houses in Cheasty have slid and been condemned and removed from Cheasty which contains 11 separate slide-prone areas. This is why it has remained a green space. Mountain-bike trails, which aren’t the prettiest thing in upland forests, would here immediately transform large swaths of this area into a Mud-Pit. 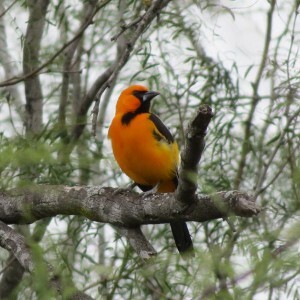 Birds are in trouble worldwide and in the Puget Sound Basin with myriad species, especially migratory birds, in decline. The Wilson’s Warbler has shown significant decline in WA state since 1980 and is a regular nester in Cheasty as is the Rufous Hummingbird, which has declined a shocking 60% in the last 40 years. A Rufous male was back on territory in North Cheasty on March 22, 2014. Species can survive in an urban area if there are a few areas not subject to the commotion of the city. Downy Woodpeckers have difficulty in the residential zone but persist at Cheasty. The Cooper’s Hawk at left is fluffed out for warmth on March 22, 2014 in Cheasty. He’s the Dad of the pair that’s on a nestsite at Cheasty that goes back over a dozen years. Come to the Meeting at Jefferson Park Community Center on Beacon Hill on Tuesday March 25, 2014 6:30 to 8pm. Parks is promoting their view at this meeting.